Reading the terms and conditions again, nowhere does it state that a flight must be taken. Just the flight needs to be booked. It states the avios will be withdrawn if a refund is taken. You will not earn avios if you do not fly (the earning avios) so perhaps this is where the twitter account could be getting confused. Also, if you do what Iberia want you to do, i.e. book some flights, receive AVIOS, spend AVIOS on further flight(s), by the time the original flights are not taken the avios have been used on a booking, or potentially even flown. You are right, the answer provided on Twitter is not right. 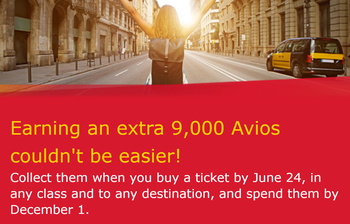 The Avios will be added on our customer’s Iberia Plus accounts within 10 days of the ticket having been bought. so we will be credited with the points 10 days after booking anyway. Another case of broken comms from contacting the airline, now on Twitter. Expect a lot of clickbait from blogs wanting to continue high traffic levels by spreading FUD. We’ll know more in 10 days. Patience. Is this now the most-commented upon thread? If it’s not, it certainly will be in about another 7-8 days! You shouldn’t be working in marketing if you can’t make a promotion like this sound wildly successful – it can be spun as a great success internally in so many ways. The math can be made to stack up; think about recruitment costs of new consumers (getting people to buy IB for the first time); decent % of points will be clawed back come Dec 1st; a good load factor analyst will be working out which flights can safely be judged to have a high no-show factor so increase the over-sell total; say you used 90K points for a flight in First [‘One idea is that 96,000 Avios will get you a roundtrip ticket in American’s A321 first class between Los Angeles and New York.] – what’s the real variable cost to IB – is it much different to the £250 paid for the 90,000 Avios? As long as they can buy Avios for less than 0.3p, then I’m sure the maths will work out for Iberia. 0.75p I think. Iberia loses a lot of money, Avios Group makes a lot of money, and it may or may not net out for IAG depending on whether people redeem for flights or third-party redemptions like hotels. Decent uplift to cashflow at a crucial point in the year, methinks. H1 ends June 30th. On that article, its all just a lot of speculation about speculation, none of the arguments stand up against any kind of real world test. I dont want to break it down point by point, not enough space. This IB promo has attracted massive worldwide interest, inexperienced points collectors jumping in and now second guessing themselves combined with websites keeping their site visits up by keeping the speculation going. Makes me hark back to the good old days of 3V cards and NS&I saving account, or Tesco veg (bought individually) – it all seemed so simple back then! The veterans on here know not to listen to customer services, especially on twitter, stick to the published Ts and Cs. See what happens in less than 10 days, and then again in December. The big unknown is the extent that they devalue the Avios before anyone can use them. Thing is, unless someone is actually planning on flying with Iberia then people could use any old number for their passport number, perhaps thats how those in the US were able to open multiple accounts. There are a few other tricks now that i think about it. Cant imagine IB are validating passport numbers with the issuing authorities across the world for a loyalty scheme. That said, i genuinely have to renew my passport this year, which may be interesting. In which case someone would raise security issues with email etc. They could ask, but point is that they dont. Related question: assuming this all works as described I’m going to need to get an extra 10k into wife’s new IB account for the redemption we want. She is a member of my BA HHA but has little or no avios in her BA account. No balances anywhere else either (very remiss). b) refer her for a new Amex Gold and try and spend the £2k to get the bonus sharpish. Any other bright ideas I’m missing? which card would you be referring her from? Currently PR Gold but looking to upgrade to Plat soon so either. Can’t reply to your comment below for some reason Harry. Anyway, yes that has always been the plan. But I’m more concerned about the speed of getting the 10k avios for her to secure the seats I’ve clocked. No clever ways I can transfer my AMEX or BA points to her? Or rather comment above. No good with threading me. You don’t have any clubcard points? Would only need £40 or so. No, clubcard balance has rather withered and died of late. Amex points have been known to slip through to someone else’s IB acct (my wife, same surname a few years ago). Thanks, I did wonder if that might be worth a shot. Does the redemption you want maybe have an avios&money option? Have you tried pairing your Amex MR account with her IB account … you never know. I actually think Iberia should be able to pretty easily figure the vast majority of flights people are clearly not going to take and just oversell the flights. They can really sell most of these seats twice and say just leave 3 out of 10 for people who might actually fly. I think they can get paid twice for most of these seats and end up #winning. I expect most of £20 tickets were for flights that never sell out anyway. i booked most of mine on the 9.35pm departure to MAD – can’t imagine it’s ever rammed ! LOL must be running as one of the most-commented articles 😀 I didn’t opt for it in the end – travels already sorted for rest of the year/start of next year so didn’t want to be stuck with expiring points! The original Iberia post has 537 comments! remember the old days when the hottest article might get up to 100 comments – 3V cards, deposits for PS4/PS3/Xbox games etc.! What made me jump in the end was the fact that the last time Iberia did a ‘stupid’ stunt like that (remember when Avis didn’t appear to have a single rental car left in the on the island?) it worked out fine. Without that precedent, I’d have stayed out. WIth it, well, let’s see. I missed this promotion by a couple of hours thanks to a long weekend of football which prevented me from checking up on my usual travel blogs. So I did a bit of digging and found that I could just book flights with Iberia and have 24 hours to cancel, just like with sister company BA. Little did I realise that unlike BA, Iberia have service fees tacked on to any cancellations regardless of ticket type. So without having done enough research on this, I foolishly went ahead and booked 5 separated trips with them in the hope that they’ll honour the promotion even though I missed the deadline by a couple of hours. I thought it wouldn’t be an issue as I could just ring them up to cancel within 24 hours if no dice on the promo. Instead I’ve had to cancel 5 separate bookings and pay £15 each in service fees to cancel them. Can anyone advise a better solution? But this plan was always doomed to failure as it takes up to ten days for the miles to post which would mean the 24 hours will have passed before you knew anyway. So. where will my 180,000 avios get two of us next year? Either try and change the IB number on the qatar or finnair site, and if that doesn’t work ask them to do it for you at airport check in when you travel. Can probably switch at check-in, or perhaps even at bag drop. I think it is load factor. Report a high load factor (which is based on sold and not flown tickets which is why you go above 100% sometimes) and the City is happy. None of which would presage IB somehow ‘cheating’ us out of the points; sticking neck on the block, I’d say that’s unlikely – I reckon T&Cs as published will be observed so the opportunity to use the points well is ours. Has anyone received the 9000 bonus avios yet? It will the closer to the full 10 days I’m sure.